This tutorial shows you how to create a pressed flower resin tray from a photo frame and liquid glass. Makes a great gift for someone special in your life. I was inspired by a photo I saw recently of an old window frame that was decorated with gems and sea glass, and hung as art. I thought about trying something like this with pressed flowers, but I never found the right window. So one day while I was at Hobby Lobby, I noticed some shadow boxes and thought they might work. Well, I ended up buying this photo frame and turned it into a serving tray. Heads up. This one takes a few days to make due to drying times, and you’ll need to press flowers a few weeks before or buy them. 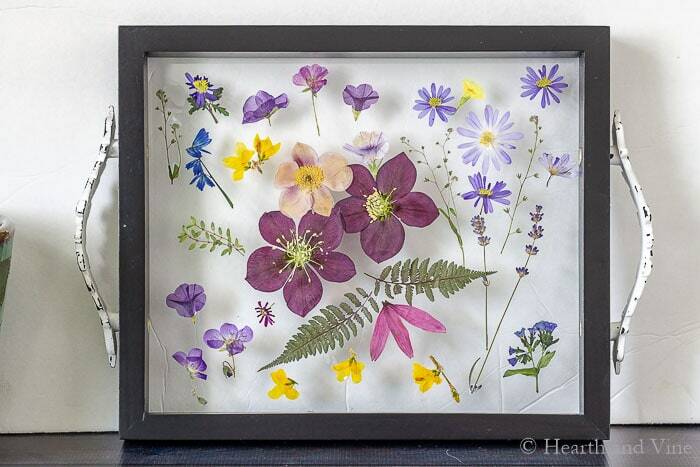 To make this pressed flower resin tray start by removing the back and paper. Then run a bead of clear caulk around the edge of the glass on the back side. It comes out white so that you can see what you are doing, but will dry clear. Next drill holes in the sides and screw in the handles. Make sure you press your flowers and leaves a few weeks before hand. You can also buy pressed flowers . Using Mod Podge or any glue that will dry clear, carefully glue your flowers to the front side of the glass. Wait for the glue to dry, and then carefully pour the liquid glass all over, using just enough to cover the plant material. If you have bubbles you can use a pin to break them. You can also see here that I didn’t wait long enough for the Mod Podge to dry. However, eventually it did dry. Here’s what the tray looks like after 2 days. The liquid glass is still a little tacky and didn’t totally harden until about day 3. Though it did turn out pretty, I’ll admit that I was disappointed that the colors changed with the liquid glass. Another option would be to get a piece of glass or Plexiglas cut the same size, similar to the bleeding tissue paper tray I made last year.. This could be placed over the flowers and glued in with caulk. It was fun trying a new product, and I imagine that it would work well with inorganic materials. I LOVE this for my front porch. Fun idea for a coffee or tea tray or just left out there. Just about anywhere really. So cute! Lovely! Can I come live in your workshop and play?! It always looks like such f•u•n!! Thanks Phyllis. One of these days I may start doing workshops but for now it’s just one of those things on my ideas list. This is gorgeous, Patti! It’s a great way to save special flowers or to just showcase some of the season’s best wherever you are. Liquid glass is new to me and now I’m curious to give it a try. This is such a great project – beautiful AND useful! Thanks Karen. This is my first attempt with liquid glass and it wasn’t hard to work with but I am disappointed at the color loss of the flowers. I have no idea if another resin would work better, however, I have seen real flowers in resin necklace and the like so I’m sure it’s possible. I love this idea cause you can also hang it on the wall when not using. Serving tray projects are the best and I’m finding a wonderful thing to have around the home. I need to get creative outside of using wood and I really like the idea of using plexiglas. Thanks Carole. I think it would be great as a wall hanging too.